Last year my wife and I visited Switzerland. It was beautiful! The bucolic splendor of Wengen (pronounced VEN-GEN) was ineffable. The romantic architecture of Lucerne melted our hearts and the towering heights of Interlaken were mesmerizing. Wealthy people might feel a sense of entitlement but as my wife and I sauntered along cobble-stoned walkways, listened to the blithe laughter of children and inhaled the pristine mountain air, I became aware that this is one of the most serene places I’ve ever been in my life. Thank God I had my loyal Nikon D7000 slung across my shoulder loaded with two capacious memory cards. I captured everything I could; crouching my body and contorting my head into awkward positions to frame the best pictures. I’m convinced that the splendor of Switzerland is so majestic that if someone held a funeral against the jagged mountain backdrop of Interlaken, even the elegy would take on an uncanny sense of happiness. After our euphoric experience overseas, my wife and I returned to New York and I popped my memory cards into my laptop. How am I going to organize these voluminous photos on both memory cards? I had a prodigious sum of images with arbitrary names in no useful order. Each image had a “DSC_” prefix followed by cryptic string of four digits. I simply wanted to rename all the photos with the title “Switzerland” and a number counting each image sorted by the oldest on top. But who has the time to manually rename each of these files? Such pedestrian tasks are perfect for computers. 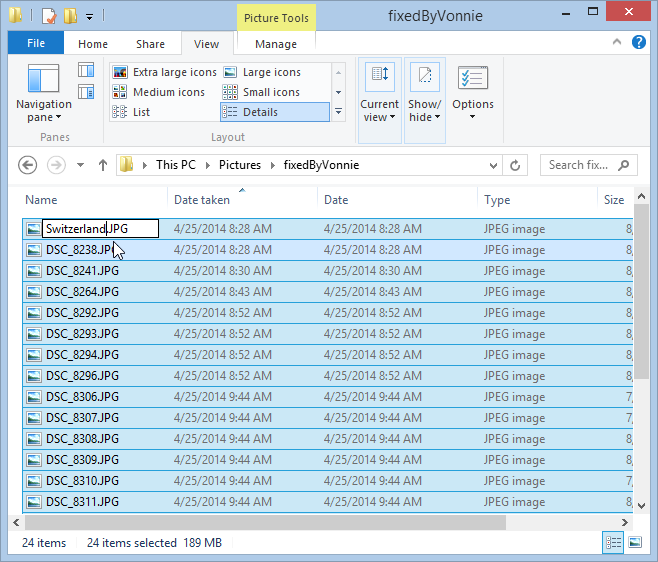 Here’s how to pull off a batch photo renaming trick in Windows 8.1, Windows 8 and Windows 7. 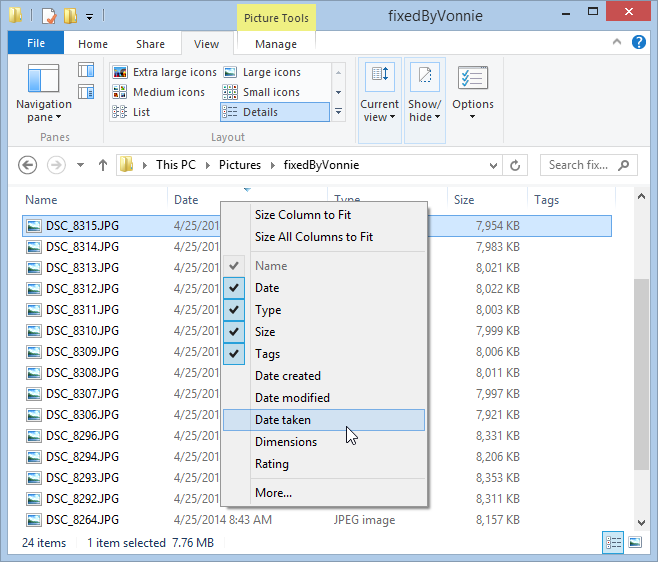 Find your files in Explorer than right click the column header and choose one of the columns from the drop down. You can also click on More for additional sort options. I’m going to add the column that shows me the date when the picture was taken. Click the Date Taken column header to change the sort order then press Ctrl + a to select all your files. We’re about to do something magical hehe. With everything still selected, press F2 and then type the name you want to supplant all those unruly “DSC_” prefixes. When you type the name into the box and press Enter, Windows deftly adds the name to each file and appends it with the file number in parenthesis. And since I sorted by Date taken my oldest pictures are at the top! By the way if you change your mind just press Ctrl + z to undo the batch file rename. I also should mention that you can concurrently rename multiple file extensions with a slick command line trick. This trick is so smart that it’ll surely have your co-workers transfixed in awe of your keyboard brilliance. haha. From the Explorer Window press Alt + f + p to open a Command Prompt in the folder you’re currently in. We’re going to use the plucky ren command to do the heavy lifting for us. We simply type ren followed by the current extension and then a space followed by the desired extension. If you can’t see the file extensions in Windows Explorer just press Alt + v + hf and they’ll show up for ya. If you need more control then I suggest downloading the Bulk Rename Utility (also called BRU by beer aficionados). Many users are daunted by the interface because the tool rudely throws all the options in your face and doesn’t look very pretty. We can break this screen into three sections. In the upper left section we have the basic folder browser. Use this to browse to the folder that contains your files. Once you click the folder you want, all the files show up in the upper right section. The last section with all those scary boxes and options, the bottom pane, contains everything you need to replace, remove, add, move, and basically change the file names in almost any way you can imagine. The key to making sense of the Bulk Rename Utility is to be dauntless; don’t be afraid of breaking anything because nothing is permanent until you click the Rename button in the bottom right corner of the screen. Let’s look at all those PNG files in the top right pane again. The two left most columns say Name and New Name. The Name is the actual file name, nothing interesting here, but the New Name column shows you a preview of what the filename will become after you click the Rename button. In other words, any changes you make in the bottom pane are instantly reflected in the New Name column so you can see how your files will be affected before you actually rename the files. That Rename button is like a Save button that makes the filename preview a reality. Oh, and one more tip: if you make a change that you want to revert just click the R button next to each option in the lower pane to Reset it. You no longer need to be naive when it’s time to rename a bunch of files. Whether you have hundreds of voice memos or a compendium of family photos, you can expertly rename all your files in one sweeping action. In Windows 8 just select all, press F2 enter the name and you’re done. From the command line you can rename extensions with the slick ren command. 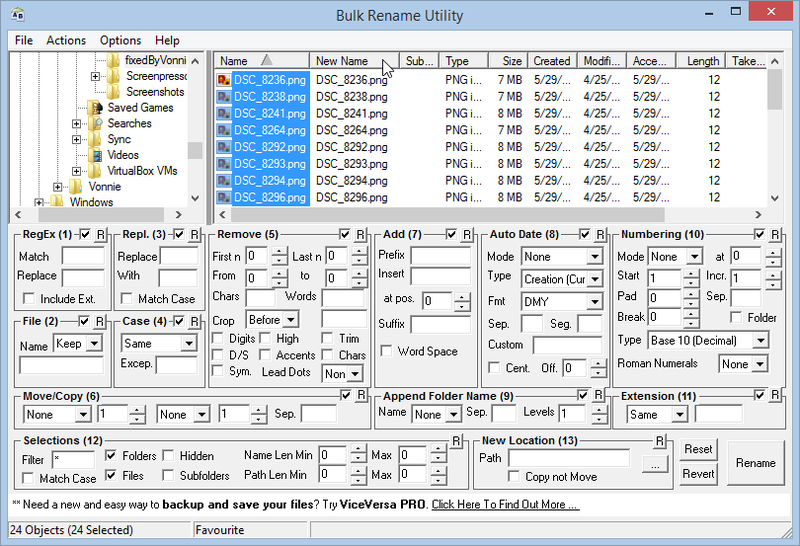 If you need more power, the Bulk Rename Utility gets the job done quite nicely. Which option do you like the best? Share the goodness in the comments below! Thanks for this tip Vonnie! This will be helpful to my daughter, who is an avid photographer. To batch rename files I suggest to try KrojamSoft BatchRenameFiles program. Love the Bulk Rename Utility. Thank you!!!! Now that was an awesome tip – organizing probably 10,000 plus video and image files – just made my day, thanks! Think I found an even faster ans straight forward way. 1-Select all photos you want to rename. 2-Click on Rename through a right click. When right clicking, make sure your cursor is on the first photo of the serie you want to rename. Once you rename that photo, it will automatically rename the rest of your selection. I’ve found the most practical and easiest way is through a program called BatchRenameFiles Tool. You should definitely give it a try. 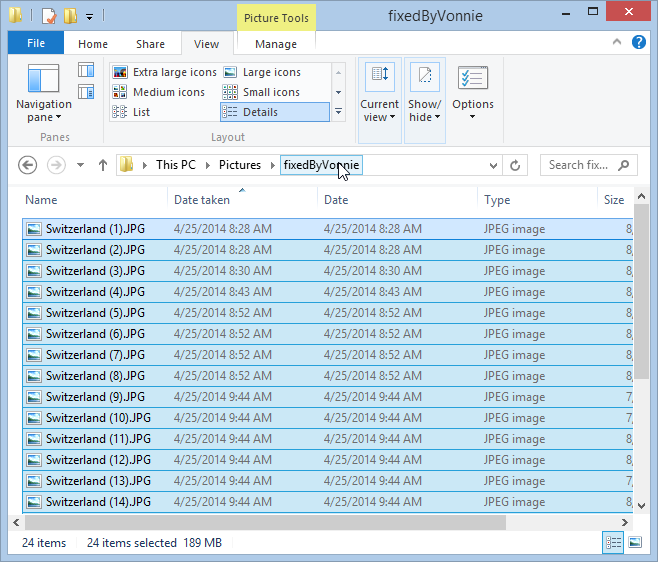 I like what Windows Explorer can do, but as a photographer I prefer to catalog my files with special software. The most useful one I found was KrojamBatch! Big thanks from my inner perfectionist for letting me organize my files, add prefixes and suffixes and add/remove letters in batch! This is a great software. You can also check one more software which is compatible with windows 8.1 also. To check my software you need to go to google.com and type on the search box- BatchRenameFiles Tool. Hope you will become happy by checking on the first link.